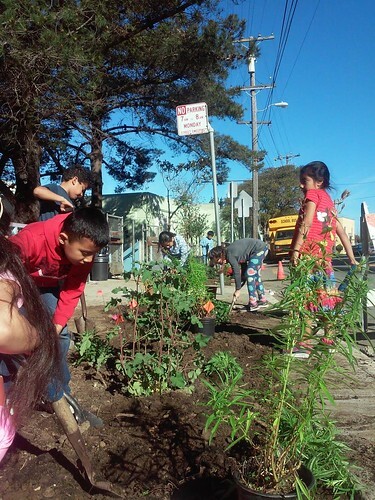 During the month of February, 2016, people from different parts of California came together to transform a street and add to the Living Library Nature Walk on Bernal Heights in San Francisco. This ecological beautification project involved creating 12 new sidewalk garden beds on formerly sterile concrete sidewalks, and planting them with California Native Trees and Understory plants in front of Junipero Serra Elementary School on Holly Park Circle across from Holly Park. In December, 2015, the SF Department of Public Works, led by Urban Forester, Chris Buck, removed the concrete in order to create the new 12 garden beds – and enlarge some of the existing tree basins. SF Unified School District Landscape Department led by Rick Maia delivered compost from Recology in order to improve the soil quality in the new garden beds. Now it was time to get planting. 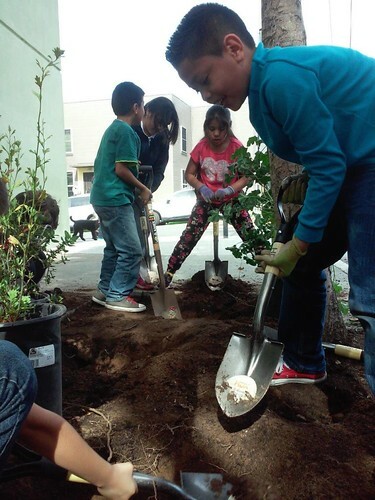 93 Students from Junipero Serra Elementary School led by A Living Library Teacher, Kristin DeRose took part in the planting. It was the students excitement and enthusiasm to help beautify their school that really moved the project forward. 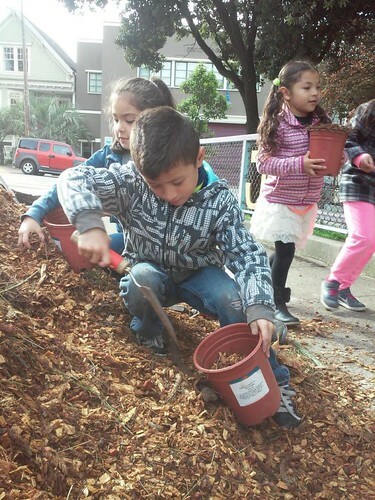 Once planting was complete, the SFUSD Landscape Department donated and delivered a huge pile of wood chips, which the students used to mulch the new garden beds. There were so many extra wood chips that the students mulched all of the trees on the block ! Through this whole, hands-on learning and transformation project, students discussed the importance of planting natives to improve air quality, increase water percolation, restore the natural Watershed, and re-attract native wildlife species to the area. They also learned about diverse native California plant species, drought tolerant plants, and how this street planting will help improve the quality of life in this neighborhood. The children were thrilled to be so empowered by their actions ! Students planted 5 trees, 18 native shrubs and 75 native Understory plants. We plan to keep continue planting on the side street bordering the school as part of the Nature Walk. * This Bernal Heights Living Library & Think Park is a prototype for the whole Islais Creek Watershed, the largest in San Francisco that interconnects eleven communities: Bernal Heights, Portola, Crocker-Amazon, Excelsior, OMI, Sunnyside, Glen Park, Noe Valley, Mission, Potrero Hill, Bayview. It is envisioned that this Nature Walk will be expanded to connect these communities by developing a new, expressive, resilient landscape interconnecting them where they have been disconnected by freeways and other streets. We are also proposing that the Chavez/101 Freeway Interchange and the Alemany/101 Freeway Interchange become the Northern & Southern Gateways to the Islais Creek Watershed. Posted on March 23, 2016 at 9:53 pm. A Living Library Reviews 2017 & Leaps Forward To 2018! 11/20/2014 Scintillating Seasons Grow A Living Library!